As a painter I find nothing puts winds in my sails like studying the works of great artists who've gone before me. DAM's got an amazing collection that has held my interest for years. 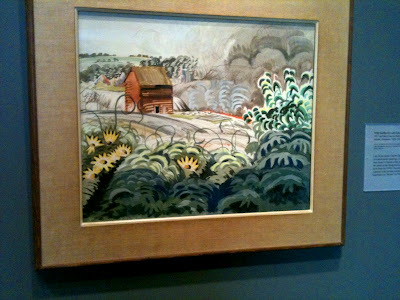 Above is a Charles Burchfield watercolor Wildflowers and Coke Oven Smoke painted in 1917 and then reworked some years later. 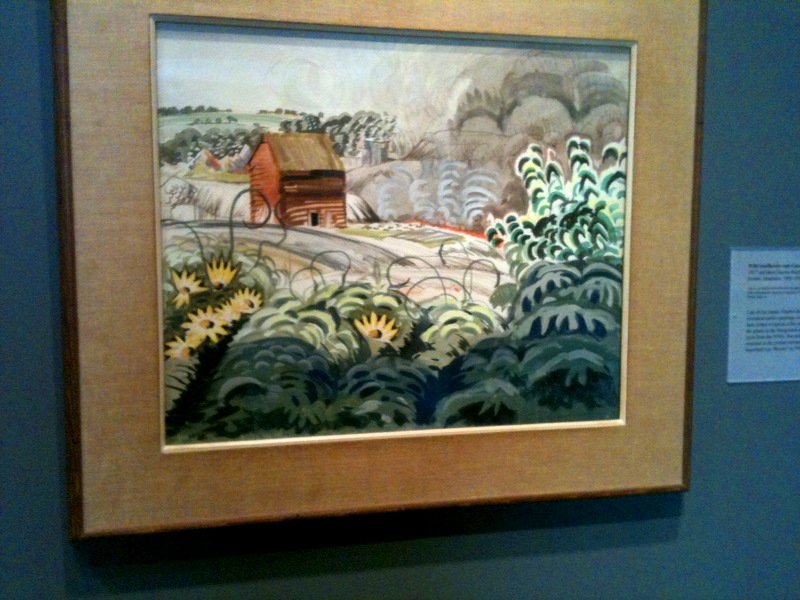 Look at the foreground where Burchfield goes a little wild with repeating the arcing rhythms in the jumble of plants. It could have looked repetitious in a lesser artist's hands, but Burchfield saves the day by contrasting warm gold highlights in his flowers against cool subtle green highlights in the tall plants at the right. So often is comes down to this, that what you paint is important, but even more it's how you paint it that makes all the difference. My guess is that Burchfield was never happy with whatever it was that used to be in the middle distance at the right hand side of his painting. Probably if he was like me he mused and fussed about it for years and then finally went back into the piece. The coke oven smoke he employs to hide whatever it was that bothered him seems to intrude on the scene a little. 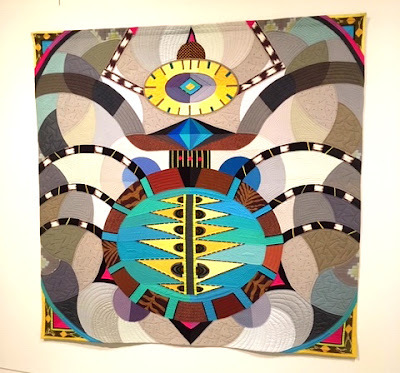 While it's not seamless, my bet is the new element probably raised the level of the piece up a whole lot. 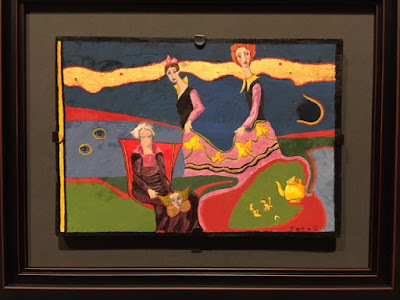 We'll never know, but whatever the truth, I love the way his enchanted foreground now dominates his painting. You can stay Charles. Here's a very unusual oil by Paul Cadmus (American, 1904 - and I had no idea he died so recently, 1999), Fidelma painted in 1937. 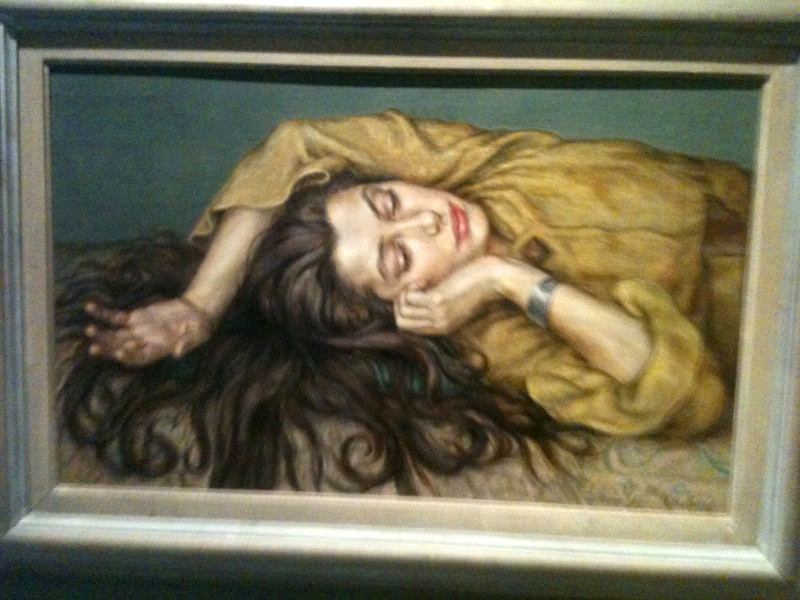 So often I find work painted in the 1930's and '40's had a special feel for light and elegantly sculpted volumes. This is a painting of the artist's sister and has to have one of the most inventive arrangements of arms and hands I've ever seen. Try an experiment- cover over the arm and hand that drapes over the dark hair and see how quickly the painting falls apart. My eye was first attracted to the network of dark walnut colored curls at the bottom of the canvas. But what's so good about Cadmus is that he invented an arrangement that plays the splash of hair off against her outstretched light arm. The two forms contrast each other so perfectly. That's the painter's task, to find the combinations that reveal to us viewers something we wouldn't normally see. Of course I had to stop and pay my respects to DAM's famous Edward Hopper painting (longtime readers of this blog are saying to themselves about now "I knew this was coming..."). I've written about this painting, Summertime, before and focused on the remarkable abstract qualities of the cast shadows from the woman and the pillar at the right side of the building. This time my eye went to the bottom of the painting where Hopper experiments with creating radically different kinds of surfaces. Naturally I looked through the fabric of the woman's dress at the hints of pink of her left thigh. 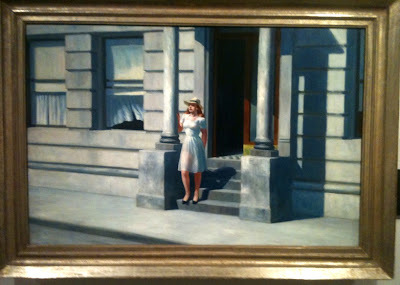 Look at the wonderful choice Hopper makes for the color of the shadowed right calf played off against the dark cool grey of the shadow on the steps. The legs themselves are studied long and hard to extract just the most expressive subtly curving silhouette possible to contrast the straight hard lines of the stone staircase. It's not so much that Hopper put in lots of detail- he doesn't. But he does concentrate on telling us something about areas of the painting we wouldn't at first think important. He goes that extra mile. It separates good painters from ordinary artists. DAM also has some amazing 19th century work including a huge collection of Pre-Raphaelite paintings, tons of John Sloan's work, and one of the best collections of American illustration anywhere. And they have a very pretty restaurant where you can rest your feet. If you're imprisoned on the ever-so-dreadful Interstate Route 95 know that the Museum is a quick 5 minute hop off the highway.